I have recently been working on a project that has allowed me to take a look into the past of my painting. What I mean is that by having to revisit some of my earlier works, I have been able to learn and experience some interesting things about myself. Firstly, while I was going through my art catalogues, I came upon some paintings that I had almost forgotten about. I had done them such a long time ago, so by seeing them again I was able to take a nice little trip down painting memory lane. Some of the pieces that I saw started to bring back some feelings of mine at that time and what was happening in my life. 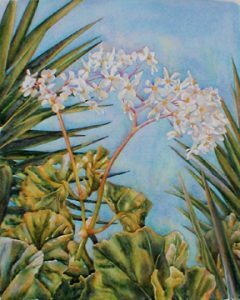 For instance, seeing the watercolour painting “White Begonia” that I did back in 2000, I remembered that when I had painted it, I had recently moved from Kingston to St. Ann in Jamaica. I remember feeling a bit lonesome at that time, however I really wanted the solitude and space of the country, hence the move. I realize now that I was going through a phase of needing some change in my life to help my artistic development. It also revealed where I was as an artist at that time. I was only painting in watercolour then and I was also trying to be more minimal in my approach. I could now see from then the progression of my work in various ways, and that was very helpful. It allowed me to look into the old to find the new. What a gift! Looking into the past can be beneficial and it can help to push us forward by allowing us to view a snapshot of our journey. Then not only do we see things more clearly, we also see that things really do evolve and everything has its time and place.